Grab your tongs and fire up the grill. There is still plenty of summer left to enjoy these Chicken and Orange Kabobs! I traveled backed to Wisconsin this past May to see my family and I spent a few days with my brother Joe and his wife Peggy. Joe is a pretty good grillmaster but Peggy is really a “master chef” in the kitchen and baker as well. She is always experimenting with new recipes and different foods and I can honestly say that I have never had a meal at her house that hasn’t been amazing! 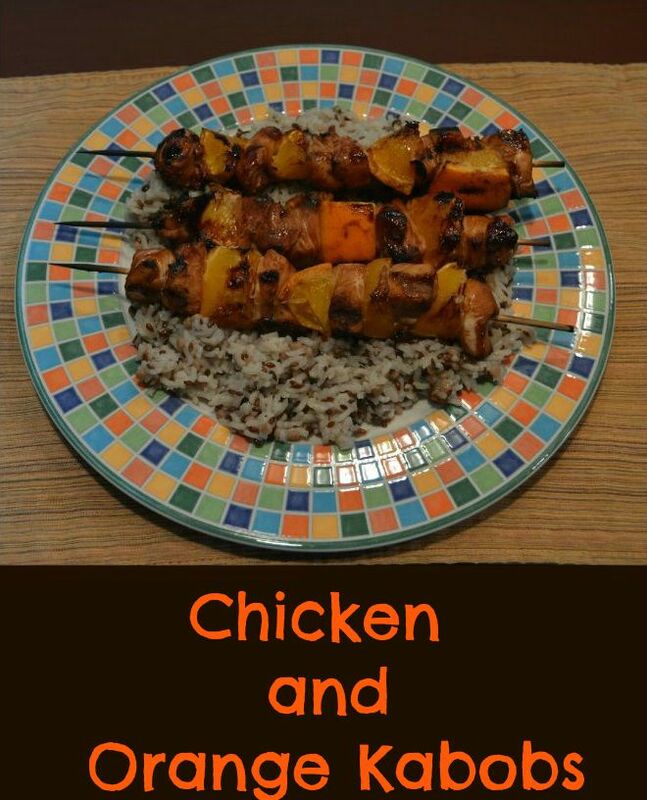 We had these Chicken and Orange Kabobs for dinner one evening and they were delicious. Peggy worked her magic in the kitchen and Joe finished up with his on the grill. 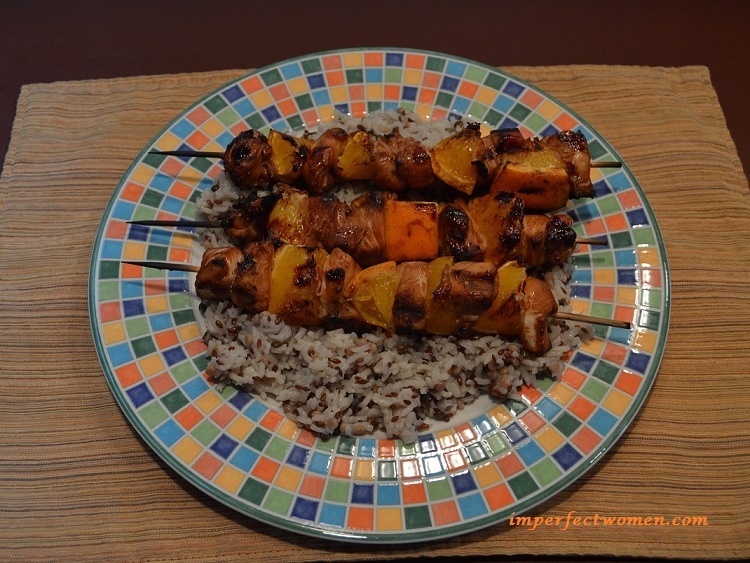 I so loved these Kabobs that I asked Peggy to write up the recipe for us and snap a picture so that we could share this deliciousness with all of the Imperfect Women readers. Combine first 7 ingredients in medium bowl. Reserve about ¼ cup for basting the kabobs. Add chicken to remaining marinade and let stand at least 30 minutes. Thread chicken and orange wedges alternately onto metal or wooden skewers. Place kabobs on grill rack coated with cooking spray. Grill 10 to 12 minutes or until chicken is done ~turning and basting frequently with reserved marinade. Keep an eye on them as they can caramelize quickly because of the honey in the marinade. I am hoping Peggy will share some more of her favorite recipes with us when she finds the time. Grill 10 to 12 minutes or until chicken is done ~turning and basting frequently with reserved marinade. Keep an eye on them as they can caramelize quickly because of the honey in the marinade. Steak & Mushroom Pie…Cooked In A Crock Pot! My kids love kebabs! These sound absolutely delicious. Me too! Not only does it look delicious, but it looks fun to eat too! I love it when fruits are incorporated in a dish. The kabobs look so tasty! I enjoy trying new recipes too and it’s always a great feeling when I cook something that everyone enjoys and keeps requesting. I may have to add chicken and orange kabobs to my new recipe list because it looks delicious and the combination of orange, ginger and garlic sounds mouth watering! I do love a citrus-y chicken! This looks delish! Thanks for sharing the recipe! Those sound really yummy. I have always liked kebabs. I love a citrus chicken recipe!! These looks super yummy! Oh this whole plate looks amazing. Looks so good, I would absolutely love to have this for dinner! Oh what a wonderful summer dish! I bet the oranges and chickens go so well together. Now that looks and sounds amazing. I would love to try! I love the idea of the flavor combinations between chicken and orange on these kabobs. They are so delicious and easy to make. These look amazing. I love the recipe sounds delicious. I haven’t had orange chicken in a while. Your recipe looks really good. That may be my next orange chicken! Yum orange chicken is something I have not made myself yet. usually I will order it or go to places and have people make them for me. It’s always great when we get to try a new recipe. I love kabobs. The recipe you posted here is similar to orange chicken, only on skewers. I will make this for my family. Thanks for sharing! This sounds amazing. I will have to try this delicious recipe this weekend for my BBQ. Adding the orange will be a great treat. Those do sound like fun kabobs to make. I think this kind of recipe is great for company. Yum! These look wonderful! I’m going to have to try this recipe. Chicken Kabobs are my favorite, but I have never tried them with orange. This one looks so delicious and yummy. I bet my husband & kids would really love this awesome recipe. Yum, chicken and orange kabobs sound delicious! I love lemon chicken so I am pretty sure I would love this flavor combo. My kids love anything on a skewer. Yum! My husband loves to grill, so I’m going to see if I can get him to make these for me! These look delicious, we love kabobs on the grill in the summer. That really looks good and doesn’t seem hard to do at all. My kids love kabobs! The citrus flavor on the bbq is so delicious & perfect to serve at any gathering. I love orange chicken and never thought of making it as kabobs for the grill! They look and sound so delicious! I can’t wait to try them. Thank you for sharing this recipe. These Orange & Chicken kabobs sound absolutely mouth-watering! I love how they’re presented in the picture! Although, I think I would prefer mine on a bed of wild rice!!! This looks so delicious, can’t wait to try it out! This recipe looks delightful enough to make this on the coming weekend. I thank you for the share today. I want to try these this summer! They look wonderful! Thanks. I love orange with chicken or beef. I never thought of using it with kebobs, this is so good, I want to try it! So going to have to try this one!! !